This winning entry for the Salon Kitchen Challenge — in which we asked readers to cook in teams — comes to us courtesy of Rebecca Farwell. Check out this week's Challenge here. We are an island-dwelling family, though not always the same island. Drew, my oldest, is a senior at the University of Hawaii on Oahu, clever boy. Twice a year he comes home to Bainbridge Island, where we stare at Seattle from across the Puget Sound. Kayaks replace surfboards here, for obvious reasons. We’re not sure how he managed to reach 6 feet and 2 inches of surfer dude stature, because Drew grew up a picky eater. Broccoli, oddly, was the only vegetable he would eat, which meant he got a lot of it. Thankfully, Mexico cured him. The day after his 18th birthday he boarded a bus in San Diego, which deposited him some miles south for three months of wilderness wandering with NOLS (National Outdoor Leadership School). He learned to ration food and cook it himself, slept on the ground, and did not see the inside of a bathroom for a mighty long time. He caught squid, pulled up clams, speared fish, and ate his haul, cooked or not, on vast, empty beaches. Each night he and his fellow wanderers mixed up bread dough, put it in a plastic pouch, and chose someone to keep it warm in their sleeping bag overnight. They called it "having a bread baby." Influenced, I’m sure, by his constant struggle to get enough calories, Drew claimed it was the most delicious bread in the world. About two months into their journey, Drew and crew were stranded by a hurricane and forced to ration food more severely. As the days added up, small cooking groups spaced themselves farther apart and closed their circle to block increasingly bold reconnaissance missions. Soon, they began to look at each other a bit differently. Drew came home from Mexico a different person; he baked bread, made salads, and concocted strange things that seemed always to include peanut butter. Now, in Hawaii, he feeds himself well, having developed a devotion to the mighty spinach leaf. He makes his mother proud. Drew and I cooked Christmas dinner together this year, for fun and to teach each other a thing or two in the process. On Christmas Eve he mixed up bread dough and, sure enough, slept with it. Paige, his younger sister, expressed disgust, but the dough emerged a happy bloated ball next morning. 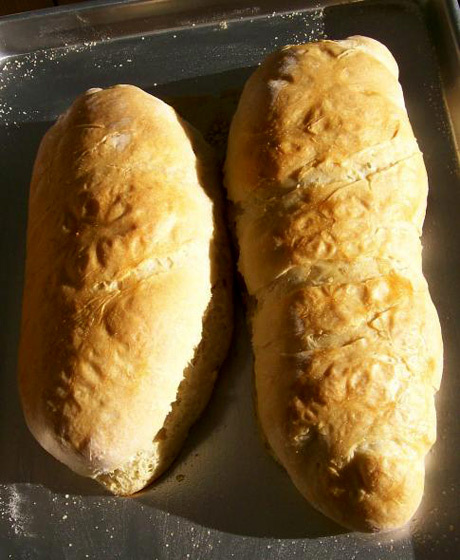 We punched it down, divided it into two loaves and let it rise again. It baked up crusty and delicious, true to prediction. I showed Drew how to make Beef Burgundy (à la Cook’s Illustrated, sorry Julia), because knowing how to braise a cheap piece of meat seems like an invaluable skill for a broke college student. Drew compiled his favorite salad, adding chopped pecans and pan-browned garlic. He dressed the greens with olive oil, balsamic vinegar, Dijon mustard and Worcestershire sauce. There were pear slices and Gorgonzola crumbles on top. It was damn tasty. I made chestnut soup, demonstrating to my son that blenders can be used for something other than margaritas. He placated me with a semi-convincing nod of appreciation. In the afternoon our friends joined us, hauling with them an embarrassment of delicious food to round out our meal: pâté and crab dip, roasted rosemary potatoes, and Brussels sprouts with pancetta. As if that were not enough, they also brought individual molten chocolate cakes that made me cry, they were so good. We have very fine friends. I can’t remember a better meal. It went on for hours, broken up by a chilly walk to some other friends’ house, where we imposed without apology on a giant family gathering. I had to tell our friends that my son sleeps with bread, but there are worse things a mother could say, and they didn’t seem the least bit fazed.